The evening meal was good value and was surprisingly good. There was a mix up over the meals - for several tables - but the staff were apologetic and very pleasant. There was a good choice for breakfast. Excellent location for the car ferry, as you might expect! The hotel was being refurbished so restaurant was effected, more like a building site for breakfast. The hotel did notify us prior or visit so were expecting the upheaval. Only stopped over night staff very friendly would use this hotel again. Easy trip from Tunnel. Quiet stay and very pleasant staff. Hotel was close to town center and tunnel entrance. Breakfast was good. Pleasant staff.Good bed and en suite.Good breakfast buffet. Good value for money, clean, quiet, plenty of car park spaces. The open plan design of the reception and restaurant area. Light, comfortable, relaxed, nice place to be. Having a restaurant there, good food, was great for me as I had been driving all day. Breakfast good too. Room and bed very comfy. Overall, great and I will stay again at IBIS. I used the hotel as a stop over prior to boarding the Calais to Dover ferry. The location is a little isolated but with easy access to the ferry terminal. The rooms although sparse were comfortable and I particularly found the bed comfortable. I ate in the restaurant on the evening and again at breakfast. The service was quick and the food very nice. Good value for money as we had a special offer, ordinarily this hotel would have been above our budget. Good location for Eurotunnel. Staff were friendly. Room had everything we needed, bed was very comfortable. Very reasonably priced coffee. Set a 10-minute drive from the English Channel and the Channel Tunnel, this hotel is 2.5 mi from Calais Harbor on the Opal Coast. 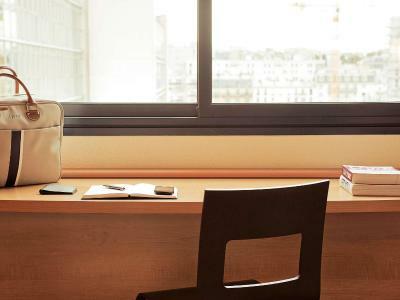 It offers soundproofed rooms, a terrace and free WiFi. 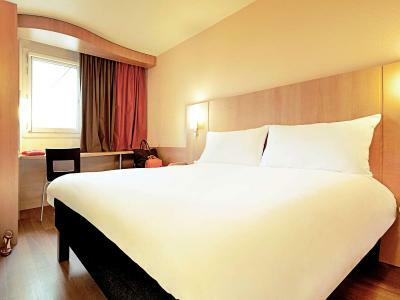 All rooms at Hotel ibis Calais Car Ferry include wooden floors, a satellite TV and a desk. They also have a private bathroom with a shower and free toiletries. Dinner can be enjoyed at the hotel’s restaurant, Café Biere et Compagnie, and snacks are served at the 24-hour bar. 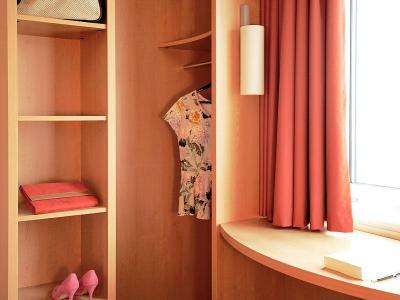 Free private parking is available on site and the hotel is 0.8 mi from Beau-Marais Train Station. Calais Lighthouse is 2.5 mi from the hotel and Bois de Ruminghem Golf Course is 20 mi away. When would you like to stay at ibis Calais Car Ferry? This double room features a computer. House Rules ibis Calais Car Ferry takes special requests – add in the next step! ibis Calais Car Ferry accepts these cards and reserves the right to temporarily hold an amount prior to arrival. Nothing ...for an overnight stay..
We had to tell them to turn the heating on as it was switched off from reception. The hotel itself is rather shabby and could definitely do with a refurb. The bedroom and bathroom were clean enough but the carpets in the corridors were very stained. There was only one potential charging station for electrical devices and this was not next to the bed which made it a little inconvenient. There were no coffee making facilities in the room. Bathroom fan was on all the time. Couldn't be more convenient for channel ferries, reception spoke good English. Travelling with two dogs... Made feel welcome... Bedroom was v small as was the bathroom... But it was clean, well priced, friendly and dinner was surprisingly good. The hotel is advertised as basic and in fact that is. However it is newly refurbished, felt fresh and it met our expectoration. The staff was very friendly even though we felt that they act a bit like machines - no real emotions.